Tostones… vegan junk food, not a party game. 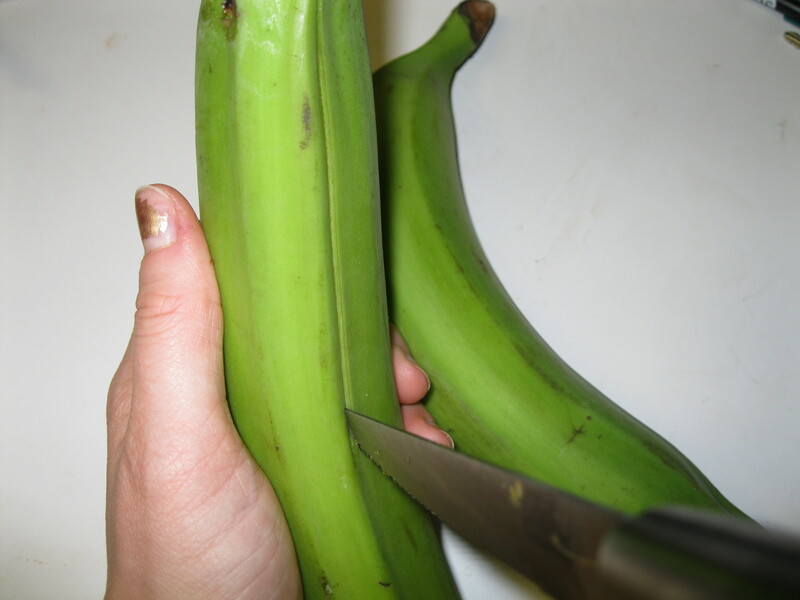 Plantains are like bananas in appearance but they’re not as sweet. Usually they’re cooked (fried, boiled, grilled, baked, whatever) green when their texture and flavor resembles that of a potato. 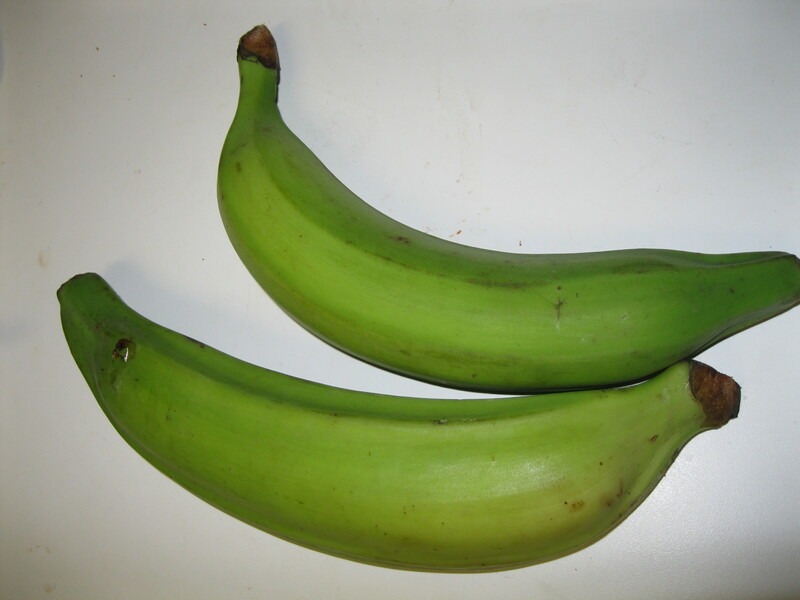 When overripe they’re either eaten raw or fried in thin chips. 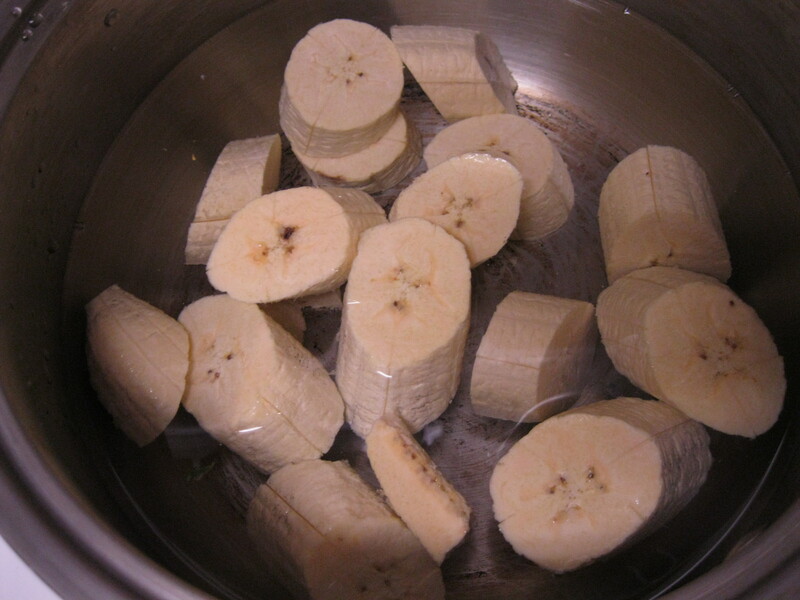 Plantains are basically the Inspector Gadget of the banana world. Here’s me peeling one… they’re a little stubborn. I’m going to make them into tostones, a regional specialty, sometimes called patacones. 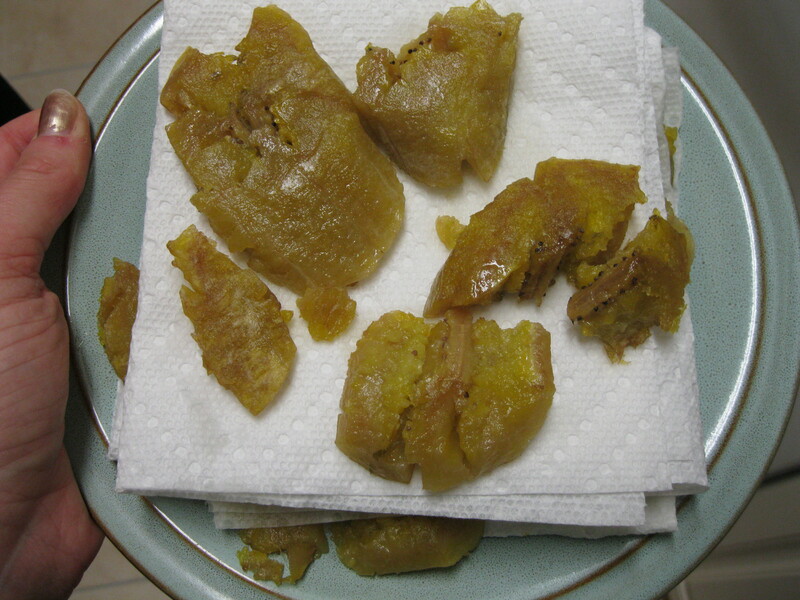 Most recipes for tostones call for twice fried plantains, but I prefer to boil for the first round instead of frying. 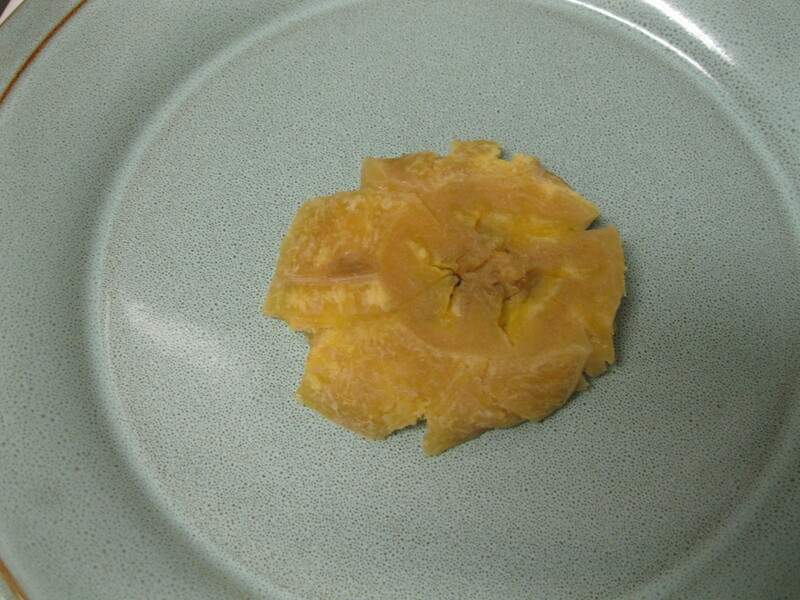 This results in a tostone that remains soft after it cools. Traditional recipes can get hard and unpalatable when cool. 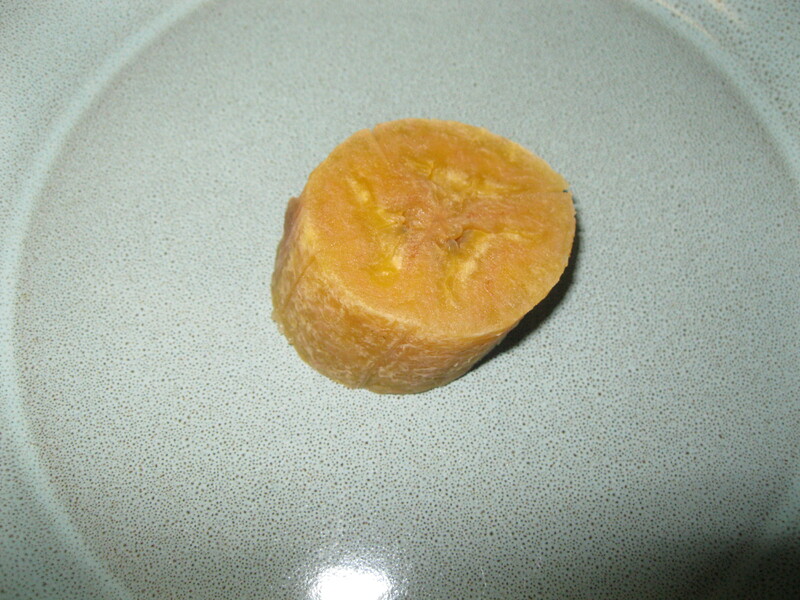 Anyways, I chopped my plantains into inch long sections (2-3cm) at a slight angle. I dropped them into water, brought it to a boil, reduced the heat to a low boil and allowed to simmer for another 25 minutes. After boiling, they should be soft and yellow. 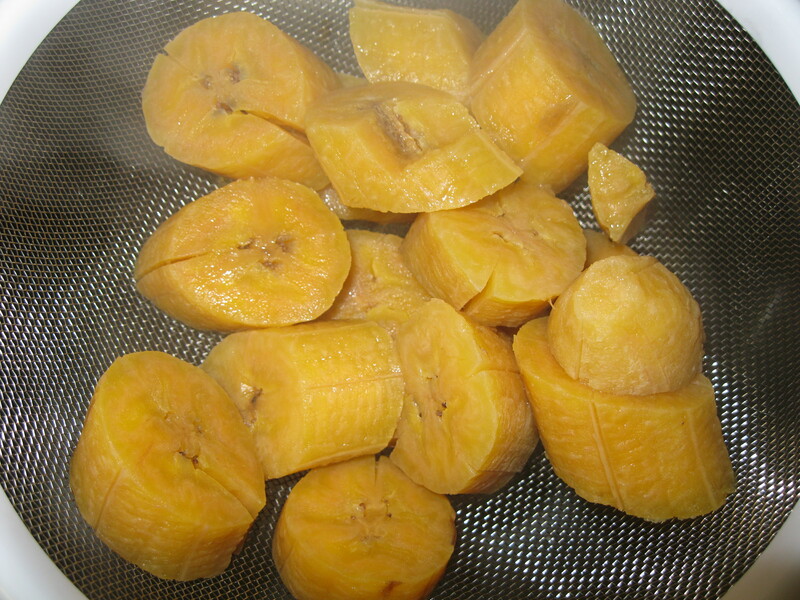 I poured the water over a strainer to collect the plantain pieces. … and SMASHED it with a clean damp glass jar. Do this carefully to maintain the aesthetic or just smoosh them for the fun of it. Then I fried it on each side for about a minute in grapeseed oil, until golden brown. You can use whatever kind of oil you like as long as it’s suitable for frying. I know Melissa likes safflower oil. I place them onto a clean dry paper towel to drain off some of the oil. They’re great with hot sauce, mojo (a garlic and parsley sauce) or just salt. They’re also rich in vitamins A and C as well as magnesium and potassium. Hot tostones you got there. I can’t wait for the fruit leather episode.